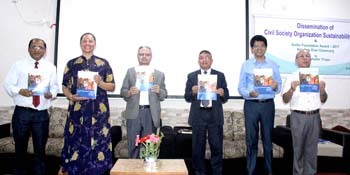 GoGo Foundation organized a program to jointly unveil the CSO Sustainability Index (CSOSI) 2016 on August 10, 2018 in Kathmandu. The program was Chaired by Anupraj Sharma, Chairperson, National Human Rights Commission while the special guests were Dinesh Thapaliya, Secretary, Federal Affairs and General Administration (MoFAGA), and Angelina Allen-Mpyisi, Director, Democracy and Governance Office, USAID, Kulman Ghising, Executive Director, Bishnu Sapkota, Chief of Party, FHI 360 and Krishna Pathak, Democracy and Governance Office, USAID and Kedar Khadka, ED of GoGo Foundation. The Executive Director of the GoGo Foundation, briefly presented the CSOSI 2016 findings. He also discussed about the process of CSOSI ranking and their position based on dimension and respective indicators. In overall ranking, Nepal is reported to be in the evolving stage with score of 4.3 out of 7. It was ranked 4th position in 2016. The Chief Guest of the program, Mr Sharma, said that it is a good initiative which helps to promote civil society's internal governance and as well as helping to understand CSO enabling environment in respective countries. It also bring the regional experiences and their learning to the forefront.